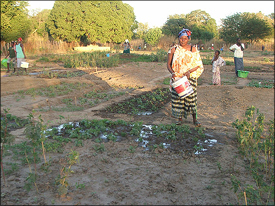 We have created a garden project in Si-Kunda, which has 200 allotments for the women of the village. Land has been set aside for their exclusive use to grow crops to be used to supplement their diet, and enable them to sell any surplus produce at the local markets. The ground was first of all cleared, a fence built around the area, and the four wells have been dug. A seating area in the shade has been created, and a toilet block and storeroom. Gates have been hung at the entrance with “Si-Kunda Friendship Garden Project” painted across the gate posts. We provided the tools, seed and fertiliser to get this project underway – the aim is for this to become self-financing, and already produce is being sold at the local markets. 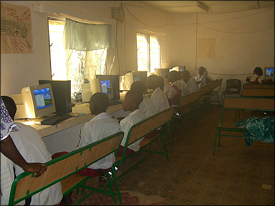 In November 2006 we installed 14 computers in this school, plus one in the administration office. 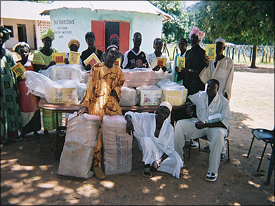 We had them shipped to Gambia, and delivered them on a very old minibus on mostly unmade roads for 200km to the school. We had to purchase a generator first as there is no electricity at the school, and once up and running with all cables and plug sockets in place we built and installed the computers. There is a current regulator, and we have UPS units. All of the equipment has been donated, and it was wonderful to be there to join in the first class with all this new equipment! 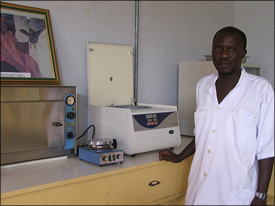 We took two further computers to Tahir School, Mansa Konko, and installed one in Soma Medical Centre. 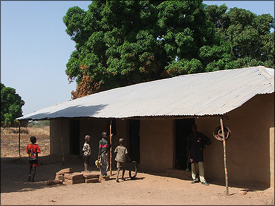 This school literally collapsed in the rainy season of 2005. The people in the village have been slowly rebuilding it, but were unable to raise enough funds to go further than the first few rows of blocks. So we supplied the funds and Sankung’s time to organise the completion of it. As I write this (Jan 2007) there is just one remaining floor to concrete and the doors and windows to go in. So we expect the school to be complete by the end of January. The children are already using it, and they now have individual blackboards and chalk, tables for the children to work at, books, toys and a variety of school equipment that has all been donated and delivered. The library in this school was infested with termites earlier in the year. They had started to destroy some of the books, so we had the room emptied, got rid of the termites, and have installed a large window at one end (as it was so dark), had some iron shelving built to replace all the wooden shelves, and finally decorated the room. The library now looks great, and is well used. 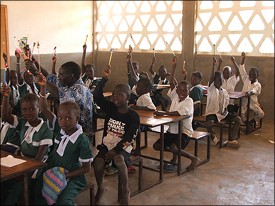 3,500 exercise books were delivered to Toniataba school in time for the start of the new school year in September. not want to go home at the end of the morning, and stay to play with the toys they have in their classroom! Five shipments of supplies were sent in 2006. Supplies have been distributed to the six schools that we are now helping to support. We delivered some medical supplies of some much needed equipment for Soma Hospital , and also Si-Kunda & Toniataba Medical Centres. One well has been rebuilt and two more repaired in the Si-Kunda village, plus the four new ones in the Women’s Garden. We currently have sponsorship for the three school teachers, helper\gardener and caretaker at Si-Kunda Kindergarten, also our project manager Sankung, and thirty five children. We also have some sponsorship for exercise books and shipments – but we really need more now that we are managing more projects and supplying more schools!